Up at 4:30 AM… And yes, the stove worked so there was coffee early this morning. And if you’re thinking: “Wow, he’s so dedicated and disciplined he wakes up at four o’clock in the morning!” Stop it. I was sound asleep at 8PM the night before so I got as much sleep as you did (probably more). Why wake up so early? Simple really. At this time of morning there are no attractive distractions to pull me away from the writing. And remember: ALL WRITER’S WANT TO BE PULLED AWAY FROM THEIR WRITING. This a universal writer’s law. We are always on the lookout for distractions. And because we have such vivid imaginations we can actually make up distractions that don’t even exist to pull us away from our writing. In fact, this post is a distraction, although a minor one because it didn’t take me long to write it. Hey I’m “writing” this post. Doesn’t that count as writing? No! See what I mean? Writer’s are really clever at this! No internet at the house. No kitchen sink either. So we went out to dinner again last night, which you know if you’ve been following this Mexico trip, is actually cheaper than eating at the house. We ended up at a nice little restaurant hidden behind a grocery store with great food. (I’m really going to miss the food down here). After dinner Marie and I made our way 3 miles to the end of the dirt road and sat in the car like we were at a Drive-In Cyber Café (except there are no lattes) and did our email and other internet stuff. The phone company said they would be at the house today, but I suspect we’ll be at the end of the dirt road again tonight as I send this off. Marie and her mother rushed off to the border this morning to pick up supplies, which leaves me at la casa solo to answer any questions the worker’s might have. It’s actually very simple. When they ask something I say: “I don’t know.” Which is the absolute truth. For instance, the carpenter (one of them) just knocked on my door and asked about being paid. I said: “I don’t know.” And told him to come back tomorrow when Marie and her mother are here. As I mentioned yesterday I tightened, chopped, finessed, revised, the first 125 pages of I,Q2…and today I’m pushing forward with the story. Obviously, I’m not able to give you a lot of details, but I can tell you that today’s writing session ended with an explosion. And today’s favorite I,Q2 sentence: They knew that we knew, and we knew that they knew that Buddy T. knew nothing about why they were really there. There are several new characters in I,Q2. One of them is ten years old and is a resident of the White House. The Secret Service uses code names for the presidential family. The code names usually all start with the same letter. The president’s code name is Peregrine (after the falcon). The ten year old above is called: P.K. Can you guess what these initials stand for? If you have a guess put it in the comment section. Casa update: The kitchen sink is hooked up temporarily. The phone is back on, although the phone company did not show up to fix it. The plumber fixed it. I’m not kidding. We still don’t have internet. There is a wireless signal coming from our router. We just can’t figure out how to hook into it. So I’m back at the end of the dirt road posting this. 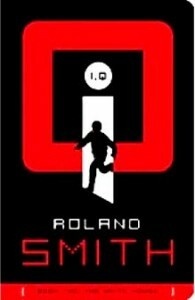 Tomorrow I’m going to post the first chapter of: I,Q Book Two: The White House. It will be pretty much in final form and it’s a bit different from the first chapter that some of you might have read tacked at the end of the trade edition of I,Q Book One: Independence Hall. Are you glad you read all the way to the end of this post? And remember… What does P.K. stand for? Post your guesses. Can’t wait to read the first chapter! P.K.- Peregrine Kid? Oh well, had to try! Can’t wait to read IQ #2!